For Jim Murphy and the OSH-WW2 Racing team the 2004 season has been a mirror of Foster's quote. In fact, this year Murphy has fallen victim to his own law. Yes, what can go wrong, will go wrong. After qualifying # 2 with a 5.96 and winning round one of eliminations, a supercharger failure cost him a loss in the semi finals. 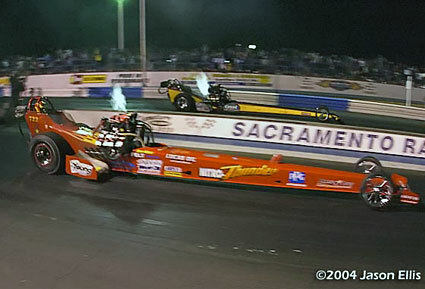 With two major events remaining, Murphy and crew have vowed to "throw the kitchen sink" at the competition. What's wrong with this picture - its not 100+ degrees at Sacramento! Thanks to a cold front that covered the West Coast, the temps at the normally blistering SRP were in the 70's (track temp 90) making for ideal racing weather. That said I'd like to acknowledge the great effort of Jason Ellis for the shots on this page. It's nearly impossible for one person to cover an event but Jason did one hell of a job at this one. Needless to say, there are several cars that were missed during any given session or round and again, that's the price you pay when there is only one photographer. Qualifying: Jim Murphy and Mark Malde were the first pair out at 6.45 pm. 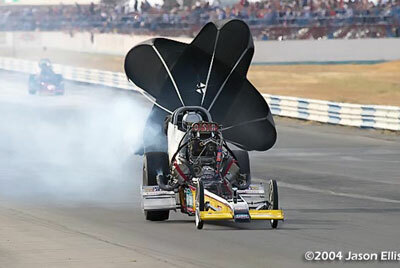 Jim clicked it off at 1100 ft at 5.97 which would be good for the # 2 qualifying spot. 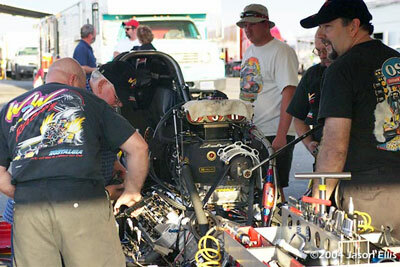 Malde, in Arnold Birky's car, shut of early with problems. 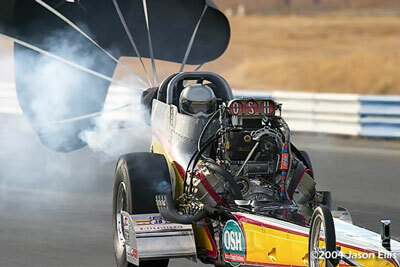 The third pair of the first round of eliminations was Jim Murphy in the OSH-WW2 Racing entry and Fred Farndon at his second outing with a Butch Blair hemi. Farndon shutoff at half track while smoke came out of Murphy's engine on the top end. 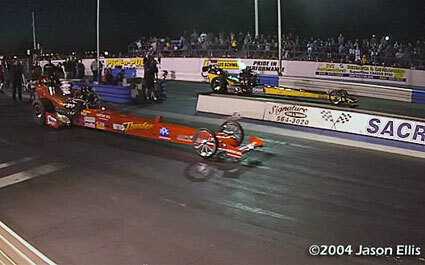 Murphy took the win with a 6.091 at just 191.00. 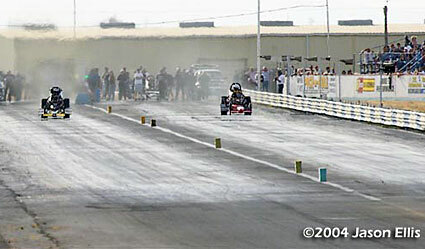 The track temperature was over 110 degrees so the track would be tricky. Between rounds its apparent that the team had no clue of the impending problem. Pair two in the semis paired Jack Harris with the reigning World Champion, Jim Murphy - a race the fans always love to see. 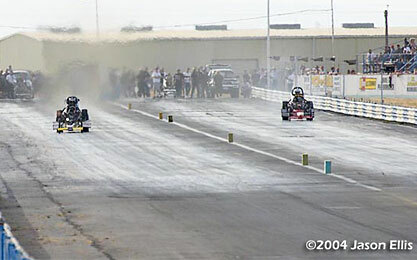 Both cars left together and it was a close side-by-side race to three-quarter track when both cars had engine trouble. Murphy suffered the worst damage with a blower expulsion. Sparks coming out of Harris' engine signaled some nipped pistons. 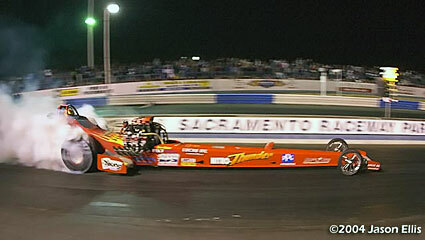 Jack took the win with low ET to that point with a 5.845 @ 232.77. 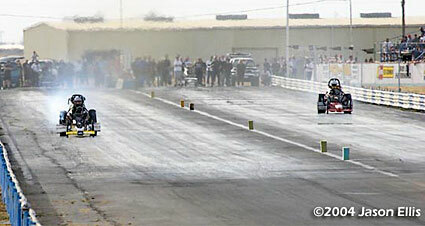 Murphy slowed to a 6.006 @ 201.54.